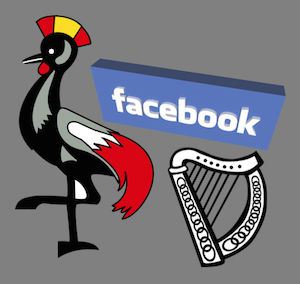 The liability of internet intermediaries for defamatory posts on their platforms was central to the decision of Binchy J in Muwema v Facebook Ireland Ltd  IEHC 519 (23 August 2016). A Ugandan lawyer objected to allegedly defamatory posts on a pseudonymous Facebook account, and Binchy J gave an order requiring Facebook to identify the account-holder. However, he declined to grant injunctions requiring Facebook either to remove the posts or to prevent the material in them from being re-posted, on the grounds that Facebook could rely on the defence of innocent publication in section 27 of the Defamation Act 2009 (also here). On the other hand, in the earlier Petroceltic International plc v Aut O’Mattic A8C Ireland Ltd (High Court, unreported, 20 August 2015, amended 8 September 2015; noted here (pdf) and here (pdf)) (see Irish Independent | Irish Times) Baker J not only gave an order requiring the defendant to identify an account-holder but also granted an injunction requiring the defendant to remove allegedly defamatory posts from a blog hosted on its site. Baker J simply made the relevant orders, whereas Binchy J handed down a full judgment explaining that section 27 was the reason why he refused to award the injunctions against the defamatory posts. Whilst his judgement is likely to be influential, it is nevertheless striking that another judge took the opposite approach, so the matter cannot be regarded as fully settled, and it is appropriate to analyse his reasoning in at least a little detail. In Muwema, the plaintff sought three orders against Facebook: (i) to identify the person or persons behind the pseudonymous account, (ii) to take down the allegedly defamatory posts, and (iii) to prevent any similar posts from being reposted. The plaintiff obtained the first, but not the second or third. In this post, I will discuss the issues in this sequence, but I will postpone a detailed analysis of section 27 to the next post. The order granted by Binchy J in Muwema directing Facebook to provide the plaintiff with any details which it holds relating to the identities and location of the person or persons who operate the page on which the posts to which the plaintiff objected had been posted. This is a Norwich Pharmacal order, named for the case in which it was first granted (see Norwich Pharmacal Co v Customs and Excise Commissioners  AC 133,  UKHL 6 (26 June 1973); see also The Rugby Football Union v Consolidated Information Services Ltd  1 All ER 928,  1 WLR 3333,  UKSC 55 (21 November 2012)), and the Supreme Court has affirmed that it forms part of Irish law (see Megaleasing v Barrett (No 2)  ILRM 497; Ryanair v Unister  IESC 14 (13 March 2013)). Norwich Pharmacal orders are being granted on increasingly wider grounds, and are now regularly being sought to unmask anonymous or pseudonymous internet commentators to bring defamation proceedings against them. Indeed, in a prescient article in 2004 (“Online Anonymity: Some Legal Issues” (2004) 11 Commercial Law Practitioner 90 (SSRN)) TJ McIntyre anticipated the application of these principles to the online context. The following year, 2005, Ryanair sought such orders to identify anonymous online critics, a tactic which it repeated in February 2013, when it secured a High Court order compelling Eircom to disclose the identities of two anonymous online critics (cp York University v Bell Canada 2009 CanLII 46447 (ON SC) (9 August 2009)). Indeed, the kind of Norwich Pharmacal order sought by the plaintiff in Muwema had been granted in the High Court in London as long ago as 2008 (see Applause Store Productions v Raphael  EWHC 1781 (QB) (24 July 2008)) and was recently granted in Nova Scotia in Olsen v Facebook 2016 NSSC 155 (CanLII) (17 June 2016)). Irish cases subsequent to the Ryanair applications have shown the breadth of the Norwich Pharmacal jurisdiction (see EMI v UPC  IEHC 274 (12 June 2013) [cp EMI v Eircom  4 IR 148,  IEHC 233 (8 July 2005)]; O’Brien v Red Flag Consulting Ltd  IEHC 867 (21 December 2015); Petroceltic v Aut O’Mattic (above); see also Various Claimants v News Group Newspapers  1 Ch 400,  EWHC 2119 (Ch) (12 July 2013)). All in all, it was unsurprising that the defendant was willing to consent to a Norwich Pharmacal order to identify the person or persons operating the impugned page (), which Binchy J granted (). But they were not willing to consent to a wider order, the plaintiff did not press the point, and Binchy J did not make one (). This is presumably because the Norwich Pharmacal jurisdiction “is a power which for good reasons must be sparingly used” (Megaleasing (above) 503 (Finlay CJ); Doyle v Garda Commissioner  1 IR 249,  1 ILRM 229,  IEHC 147 (27 August 1997); and see Warman v Fournier 2010 ONSC 2126 (CanLII) (3 May 2010)). So, the plaintiff won a Norwich Pharmacal skirmish, but he emphatically lost the battles over the injunctions. Before the commencement of the 2009 Act, there had been a great deal of caselaw on the question of the availability of interlocutory or final injunctions in defamation cases. Notwithstanding the clear terms of section 33(1), after the commencement of the 2009 Act, courts either continued to apply the pre-Act line of authority commencing with the judgment of Lord Coleridge in Bonnard v Perryman  2 Ch 269, or at least to interpret section 33(1) through the lens of those cases. Mercury Engineeringv Mc Cool Controls & Engineering Ltd  IEHC 425 (19 July 2011) provides an excellent example of the first tendency. The plaintiffs in defamation proceedings sought an injunction, and referred to section 33 of the 2009 Act. However, under the heading “Legal Principles”, and in answer to the question “What are the legal principles applicable?”, Murphy J ignored the 2010 Act entirely, began his analysis with Bonnard v Perryman, discussed subsequent authorities, and declined to award the injunction. He would almost certainly have reached the same conclusion by applying section 33(1), and that is the route down which he should have travelled. The Court had such jurisdiction prior to the Act of 2009, but now that the Oireachtas has legislated in the area, it seems to me to be strongly arguable that such orders may only be made within the strictures of the Act. In the end, Binchy J did apply section 33; but analytical clarity would have been much better served if he simply done so and not cast wistful glances at, or detoured into, the common law principles that have been displaced by the Act. The great strength of the common law is that so many judges have said so much; the great weakness of the common law is that so many judges have said so much. Either way, to borrow from Sati, there comes a time for everybody when words and reason become a great weariness. To add more to the plain words of statute, to afford those words a meaning other than what ordinary English requires, seems to this Court to be unnecessary. I could not agree more. As to the application of section 33(1) in Muwema, Binchy J accepted that the allegations against the plaintiff were prima facie defamatory for the purposes of paragraph (a), but concluded that the defendant could rely on two defences for the purposes of paragraph (b). The first was the defence of innocent publication in section 27 of the 2009 Act (also here). The second was an immunity provided by the E-Commerce Directive Directive 2000/31/EC, as transposed into Irish law by the European Communities (Directive 2000/31/EC) Regulations 2003 (SI No 68 of 2003). I will discuss these defences in my next post. The plaintiff also sought an injunction to prevent the activist behind the pseudonymous account, or others, from republishing the same allegedly defamatory material. Such an injunction would only be available on foot of section 33 of the 2009 Act, and Binchy J had already held that no injunctions could be granted on that basis, because the defendant would inevitably be able to rely on the defence of innocent publication in section 27. This consideration applied as much to the takedown order considered above as it did to the order against republication being considered here; and since he refused the takedown order, Binchy J also refused the order against republication for the same reasons (). There is another reason why the order against republication should have been refused. For Binchy J, it was apparent that this was “in the nature of a prior restraint order”. In the US, there is a strong presumption against the constitutional validity of prior restraints upon speech (New York Times v United States 403 US 713 (1971)). The European Court of Human Rights considers that the dangers inherent in prior restraints are such that they call for the most careful scrutiny (Observer and Guardian v UK 13585/88 Series A no 216, (1992) 14 EHRR 153,  ECHR 49 (26 November 1991)). The UK courts take the view that, on its face, prior restraint is seriously inimical to freedom of speech; it must be scrutinised with particular care; and it needs the fullest justification (R (ProLife Alliance) v BBC  1 AC 185,  UKHL 23 (10 April 2003); R (Laporte) v Chief Constable of Gloucestershire  2 AC 105,  UKHL 55 (13 November 2006)). Indeed, at Irish law, it is elementary that any party asking a court to impose a prior restraint must justify it, and any such restriction must be scrutinised with particular care (Mahon v Post Publications  3 IR 338,  2 ILRM 1,  IESC 15 (29 March 2007)). These constitutional considerations should guide the interpretation of section 33 of the 2009 Act, and would re-inforce Binchy J’s refusal of the injunction. Although Binchy J did acknowledge that the “reluctance of the courts here and in other jurisdictions to grant prior restraint orders reflects the importance attached by the courts and society at large to freedom of expression” (), it is not clear whether these kinds of strictures are what Binchy J had in mind when he described the injunctions to prevent republication as prior restraints. Nevertheless, this is exactly what they are; and it follows that the injunction sought by the plaintiff, if not presumptively unconstitutional, certainly needed the strongest justification, and for Binchy J it was not forthcoming on facts. In any event, the defendant made similar arguments from a different starting point. In Case C-70/10 Scarlet Extended v SABAM  ECR I-11959,  EUECJ C-70/10 (24 November 2011) and Case C-360/10 SABAM v Netlog NV  EUECJ C-360/10 (16 February 2012), the Court of Justice of the European Union held that an injunction requiring the defendant to install a system for monitoring and filtering all electronic communications passing through its services, which would be applied indiscriminately to all of its customers and for an unlimited period, in order to prevent illegal downloads of music, was disproportionate and contrary to the E-Commerce Directive (above). The defendant submitted that the prior restraint orders sought by the plaintiff in this case would similarly offend the Directive. However, since he concluded against the injunction on other grounds, he did not have to consider this ingenious argument, and in the event did not do so. The judgment of Binchy J in Muwema v Facebook is the latest word on the liability of internet intermediaries for defamatory posts on their platforms, but it cannot be regarded as the last word. It leaves too many questions open, and provides too many unclear answers, for that. The Norwich Pharmacal issue has returned to court. Facebook asked Binchy J to revisit his decision after it had learned that a second, or fake TVO page, had been set up on Facebook, that a former employee of the US Embassy in Uganda had been arrested by police on the incorrect presumption he was TVO and detained for 48 hours at a notorious detention centre in Kampala (Irish Times, 19 January 2017). Binchy J ordered TVO to remove the defamatory posts from his or her Facebook page within two weeks, and held that if he or she did not, a new application can be made to have his or location and identity revealed (Irish Times, 8 February 2017 | Irish Independent | The Times | allafrica here, here and here).